Look everybody, it's a Christmas-themed blog post in late January! There's no possible way this was started in early December but forgotten about until now. Ah, let's get right to it. European mistletoe (Viscum album) is a strange plant. Instead of being satisfied with perfectly good soil, it puts down roots inside trees and shrubs, feeding off of them in order to produce branch-borne balls of smooth yellow-green leaves and glue-filled white berries. The Vikings and Druids were clearly drawn to its weird ways, as the plant makes an appearance in their respective mythologies. From there, it ended up in Christmas traditions, particularly the whole kiss a person standing beneath a sprig of it. Generally speaking, mistletoe refers to a globally distributed group of flowering plants belonging to the order Santalales. What sets them apart is their ability to live off of other larger plants. Being hemiparasites, mistletoes are capable of making small amounts of sugar via photosynthesis but obtain most of their carbs (and all of their water and inorganic nutrients) from their host. 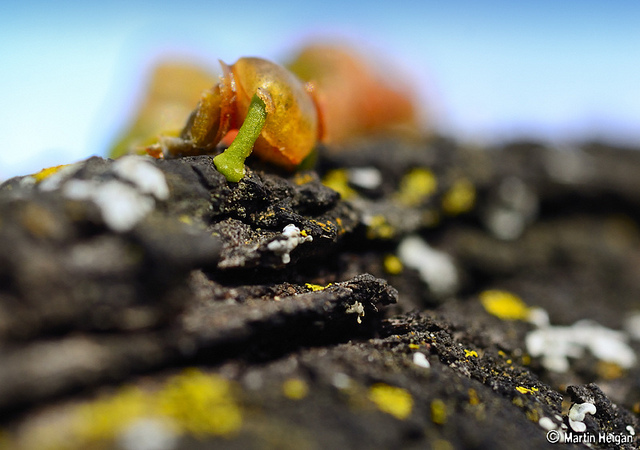 After a goo-coated mistletoe seed becomes affixed to the branch of a susceptible shrub or tree, it sprouts a root-like haustorium capable of worming its way into and throughout the branches of its new home. Haustoria are able to tap into their host's xylem and phloem, transport tissues through which flow water and nutrients. Of all the mistletoes, the meanest are clearly those belonging to the genus Arceuthobium. Owing to their relatively small size, they're known as dwarf mistletoes. Yet their stature belies a highly destructive nature. Most species are found in North America growing on evergreen (coniferous) trees. We're talking fir, hemlock, pine, and spruce (softwoods of the families Pinaceae and Cupressaceae). Unfortunately for us, these trees happen to be valuable sources of lumber as well as key components of many forest ecosystems. As it spreads within a stand of trees, a dwarf mistletoe brings injury and death. It also salts the earth, so to speak, since its growth within trees can ruin the structural integrity of their wood and thus its usefulness as a building material. Forestry companies are not particularly big fans of dwarf mistletoe, let me tell you. The external part of a dwarf mistletoe (eerily, most of the plant is found inside the branches of its host) is sometimes likened to a coral, arising from a branch as a tangle of colourful shoots. Depending on the species, shoots come in brown, red, orange, yellow, and yellow-green. They also bear stubby scales in place of leaves. These features are indicative of just how crappy dwarf mistletoe is at photosynthesis, standing in contrast to the green chlorophyll-filled foliage of its conifer hosts. Just as people infected with a flu virus or strep bacterium end up displaying a particular set of symptoms, so do trees infected with dwarf mistletoe. A swollen (and sometimes sore-ridden) section of a branch often marks where it has been invaded by a germinating mistletoe seed. After a couple of years, the infected branch may sprout a dense collection of malformed shoots known as a witches' broom, its development machinery having been hijacked. 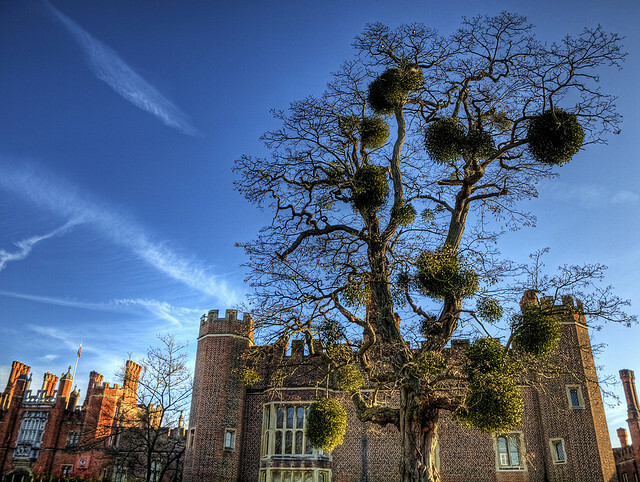 Around this time, the mistletoe will send up shoots of its own (it initially focuses on snaking its haustorium throughout its host). Now, trees have a hard enough time of it without having to feed a thieving mistletoe and a bunch of weirdo brooms it wasn't planning on growing. As a mistletoe infection spreads and weakens a tree (this often isn't super noticeable until more than half of the branches are infected), its uppermost branches begin to die off. With time, the entire tree will succumb to the mistletoe, the brooms (and infected branches) usually surviving the longest. Infected trees can potentially survive for decades before biting the dust. Dwarf mistletoe berries, which form at the ends of shoots, are basically little water balloons. As they ripen, their internal hydrostatic pressure builds until they finally pop (this video is very brief, so I suggest slowing it down and giving it a couple of views). In the lodgepole pine dwarf mistletoe (Arceuthobium americanum), the pop appears to be triggered by a plant-driven increase in the temperature of ripe berries. This may be the result of a particular type of oxidase enzyme known to be involved in heat production in plants. Much like the rubbery remnants of a popped balloon, seeds can end up landing a couple of metres away after the berries explode. The seeds are coated in goo, meaning they'll tend to stick to the branches of nearby trees if they land on them. Seeds often end up stuck to the bottom branches of the same tree they were launched from, resulting in multiple infections in the lower part of a tree. While dwarf mistletoe is certainly bad for its coniferous hosts (and having a bunch of injured or dead trees isn't exactly great for overall forest health), infected trees provide a highly accessible food source for insects and fungi. Witches' brooms can provide a foundation for nest construction by birds and small mammals. Finally, although dwarf mistletoe shoots aren't particularly appealing, a couple of bird species are known to eat them. Shoots of the lodgepole pine dwarf mistletoe are home to a community of fungi, which appear to pass from generation to generation by establishing themselves in the berries and seeds of the plant. It's been shown these endophytic fungi can beat up other fungi capable of causing disease in the dwarf mistletoe, suggesting they protect the mistletoe from harm. This knowledge may end up proving valuable to those looking for a means of controlling mistletoe infestations. Logan BA, Reblin JS, Zonana DM, Dunlavey RF, Hricko CR, Hall AW et al. 2013. 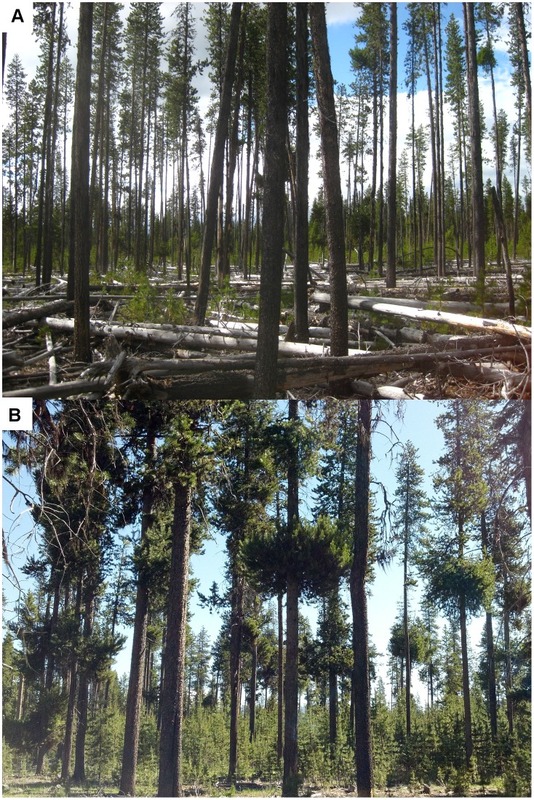 Impact of eastern dwarf mistletoe (Arceuthobium pusillum) on host white spruce (Picea glauca) development, growth and performance across multiple scales. Physiologia Plantarum 147(4):502-513.